November in Gatlinburg and Pigeon Forge marks the changing of the seasons with multiple events celebrating winter. Moving from the colors of fall into the glitter of Christmas, this time presents a host of things to do in Gatlinburg and the whole area. Early in the month, the two towns turn on their millions of Christmas lights, joined by Sevierville in a coordinated series of lightings and celebrations, beginning the Winterfest and Winter Magic festival seasons that last into February. 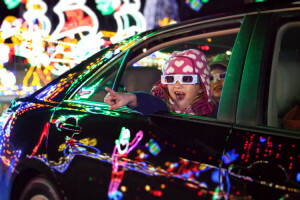 Dollywood also lights up its own village with millions of lights, as it begins its Smoky Mountain Christmas season of high-talent shows and events. The nightly light-shows synchronized to Christmas music are impressive events you’ll want to catch at least once in your life, and the evening parades are huge fun and excitement also. Close to Dollywood’s heart is Dolly Parton’s Dixie Stampede in Pigeon Forge, one of the best shows at any time, and especially colorful during its Christmas season, which starts in early November and runs until the new year. The Stampede too has a few million lights to dazzle us, starting from outside the theater and moving into the huge, state-of-the-art arena with its famous horsemanship and elaborate worlds of Christmas scenes and characters. Seen enough lights yet? Not until you’ve seen Shadrack’s Christmas Wonderland, out by Sevierville. This is a whole drive-through maze of Christmas scenes and lights coordinated to music, acclaimed as one of the best audio-visual productions in the region. Stay warm in your car with family and pets, tune into the music on the radio, and be dazzled by the sights. Shadrack’s opens early November and runs every night including Christmas, through early January. As the month moves on towards Thanksgiving, Ober Gatlinburg ski area gets its Snow Tubing ready to begin the ski season. 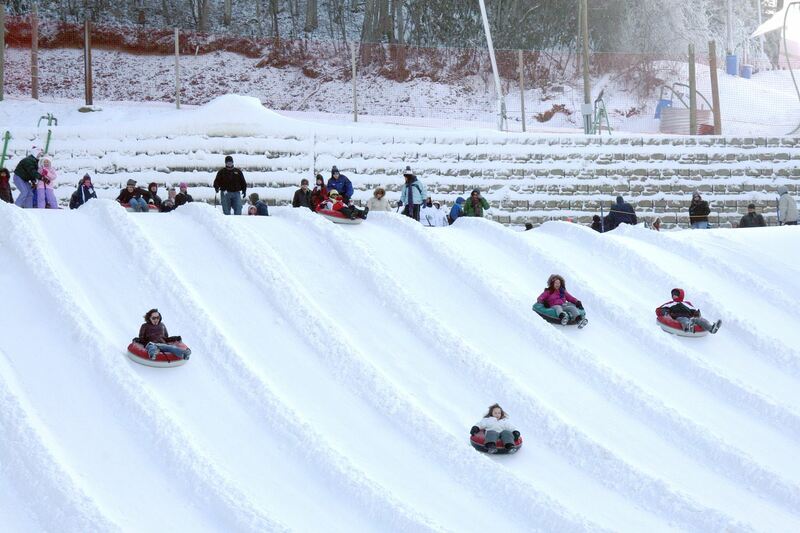 Safe and fun for the whole family, the snow tubing run is a great way to get out and up the mountain. Meanwhile, at the other extreme further up the slopes in Ober Gatlinburg’s Freestyle Terrain Park, the season of freestyle sessions begins with Back in Blue, the first evening festival event where advanced skiers and boarders can practice and show off their moves. 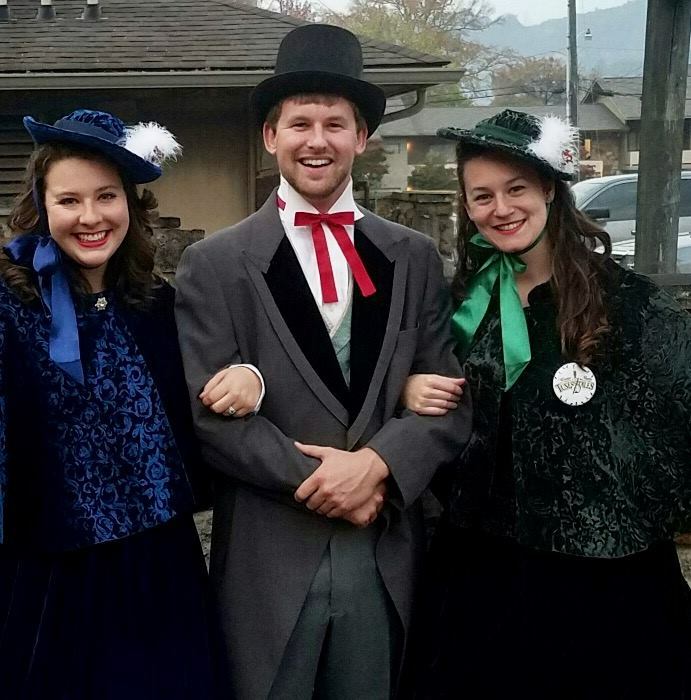 Back in town, on a quieter note, Gatlinburg hosts the annual Festival of Trees held in Thanksgiving week. This is an indoor event, held this year November 22-27, 2016. Hundreds of lavishly decorated Christmas trees in a maze-like forest are dressed with unique and handmade ornaments from the huge local artisan community, especially for this benefit event to help local youth. Kids love the event, with their own crafts projects area, breakfast with Santa, and family photo opportunities. All the shows and attractions put on their special Christmas and winter celebration style during this season, and in Gatlinburg the entertainment comes to the streets themselves. This is Winter Tunes & Tales, featuring the popular street performers and musicians who regale the strolling crowds during summer with live music, conversation and storytelling. Tunes & Tales returns to downtown Parkway for Friday and Saturday evenings, beginning the day after Thanksgiving and lasting four weeks. Expect strolling carolers, Santa and his elves, Frosty and Rudolph dancing downtown, dulcimer music, and the telling of local tales. If you want to get inside in the warm, the 2016 Thanksgiving Craft Show kicks off a few days before the holiday date on November 22, running through the 27th, then immediately giving way to the Christmas Craft Show, November 28 through December 4. This is a perfect gift opportunity, with the unique hand-crafted items of Gatlinburg’s artisan community, one of the largest in the country, and renowned for quality offerings. Craft shows are one of the best and most popular things to do in Gatlinburg, and the Thanksgiving and Christmas shows, held back to back, perform a rite of passage from the end of harvest time into the true beginning of the Christmas holiday season.